Satellite data showed that flight MH370 flew into the southern Indian Ocean, Datuk Seri Najib Razak said today, as Malaysia Airlines said the flight is lost "beyond reasonable doubt". "Flight MH370 flew into the southern Indian Ocean," the Prime Minister said in Kuala Lumpur tonight. In a statement to relatives of the 239 people on board the flight, MAS said: "We deeply regret that we have to assume beyond any reasonable doubt that MH370 has been lost and that none of those on board have survived ... We must now accept all evidence suggests the plane went down in the Southern Indian Ocean." Najib said families of the passengers and crew had been briefed of the latest development. 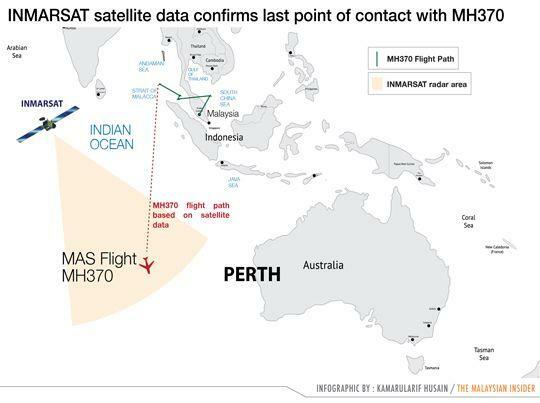 British satellite company Inmarsat and the UK Air Accidents Investigation Board (AAIB) had used a new system to calculate MH370's flight path. "I was briefed by representatives from the United Kingdom AAIB today and Inmarsat, who had performed further calculations on their existing data," Najib told reporters. "They had used a new type of analysis which had previously never been used before in an investigation like this," he said. "Both Inmarsat and AAIB have concluded, based on the new analysis, that MH370 flew along the southern corridor," Najib told a press conference at the Putra World Trade Centre. "The last position of MH370 was in the middle of the Indian Ocean, west of Perth." "This is a remote location far from any possible landing sites. Therefore, it is with deep sadness and regret that I am informing you that MH370's flight ended in the southern Indian Ocean." Najib declined to take any questions from the floor, saying a press conference will be held tomorrow to divulge further details. A reporter with Capital TV could not accept the news as Najib spoke, breaking down in tears, as did another male reporter. the lost Adam Air B737-400 in January 2007. Prior to the disappearance of fight MH370, the deadliest crash of all time in Malaysian aviation history was on December 4, 1977, when flight MH653, a Boeing 737-200 (9M-MBD), was hijacked and crashed in Tanjung Kupang, Johor, killing all 100 people aboard. The other accident involving MAS was on September 15, 1995, when flight MH2133, a Fokker 50 (9M-MGH), crashed during approach in Tawau, Sabah due to pilot error. The crash killed 34 people. Present at tonight's press conference were acting Transport Minister Datuk Seri Hishammuddin Hussein and Foreign Affairs Minister Datuk Seri Anifah Aman. – March 24, 2014.